It's also a fairly easy recipe to prepare. I used a garlic and herb rotisserie chicken from the deli at the grocery store and that made it even easier! I even managed to get a few side dishes made to go with it. Seems like I can either get the main dish, or the side dish, but getting a whole meal made at once eludes me a lot of the time. I served it with roasted broccoli, roasted potato wedges, and cheesy garlic bread. The only thing I was wishing for was a nice salad to go with it. On a side note, I realize that the picture to go along with this post is far from great. I'm having...issues. Some of it is camera-based, some is user-based, and some is user-family-based! In other words, my camera is not that great, and seems to be cooperating even less these days. I don't know a ton about photography, although I'm trying to learn. And then there's my family. Sometimes it's just plain hard for me to take the time to get a good picture, especially when the bigger kids are hungry, the baby is fussy, and the hubby is rolling his eyes at me for grabbing the camera before I start serving up supper. Please tell me I'm not the only one that deals with these things!! Preheat the oven to 375'F. Spray a 2 qt baking dish with nonstick cooking spray. Cook the orzo pasta according to package directions in well salted water. Be careful not to overcook it. Drain and set aside to cool slightly. In a large bowl, combine the eggs, ricotta, and sour cream until mixed well. Stir in the mozzarella, Parmesan, chicken, red peppers, seasonings and cooled orzo. Pour into the prepared baking dish. Bake for 30 minutes or until set. Turn on the broiler, and cook until golden on top, 3-5 minutes. Remove from the oven and wait 5 minutes before serving. This looks tasty, Katy. Have to give it a try. Yep, eye rolling happens here too. I just have a simple sony digital but the pics come out pretty well. It's all about the light. You do a great job with it all. Oh please, look at my most recent post for some really lousy pictures. Don't feel bad - seriously. I wonder if my kids would like that, because I seriously would! Yum, I love orzo. 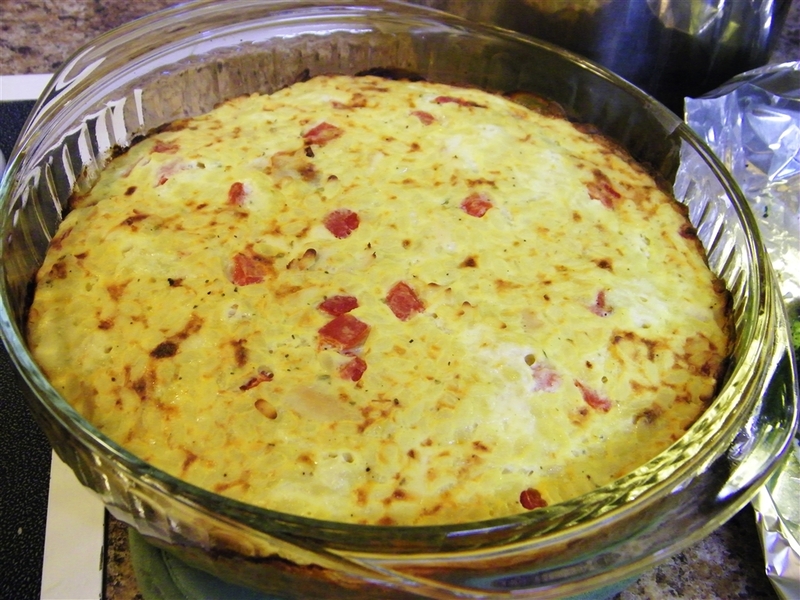 The frittata looks really good, I never would have thought to put orzo in one.